A Vaccine For Herpes Symptoms? Scientists at Vical have come up with a vaccine against the Herpes viruses, HSV-1 and HSV-2, that has successfully completed animal testing and is set to begin human trials as early as 2013. Cold sores and genital warts are the main Herpes symptoms, but pain, itching, and redness may also accompany an outbreak (before, during, or after). Herpes symptoms, whether the type that causes cold sores or chicken pox, are hallmarked by pus filled blisters that are highly contagious. Because Herpes symptoms are so contagious, it’s estimated that 1 in 6 US adults has the virus, which can lay dormant for months. Outbreaks of Herpes symptoms are most often associated with a weakened immune system. Stress, another illness, pregnancy, and aging are all potential causes of a weakened immune system and corresponding outbreak of Herpes symptoms. Of course, despite the prevalence of the Herpes virus/cold sores, it’s not usually a serious or life-threatening disease. 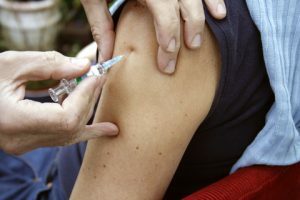 With thousands of vaccines currently being pushed to market, it’s questionable which ones are really worth the potential side-effects (vaccines can cause redness and pain at the site of the injection, and if either mercury or aluminum is used to stabilize or preserve the vaccine than each one is increasing chemical exposure, which adds up fast). Weigh In! Do you think a Herpes vaccine would fall on the side of beneficial, or overkill? Next post: No Needles? Then No Hepatitis C Transmission.